Rockbolting: Principles and Applications brings current theoretical and practical developments in the most widely used support device for underground rock excavations. Today, one cannot find any rock excavation project that does not use rockbolts for rock support. The worldwide annual assumption of rockbolts is in the billions, with pieces applied to mines, tunnels and other types of geotechnical projects for rock and soil reinforcement. The text is based on over 25 years of experience of the author both as academic and practitioner. 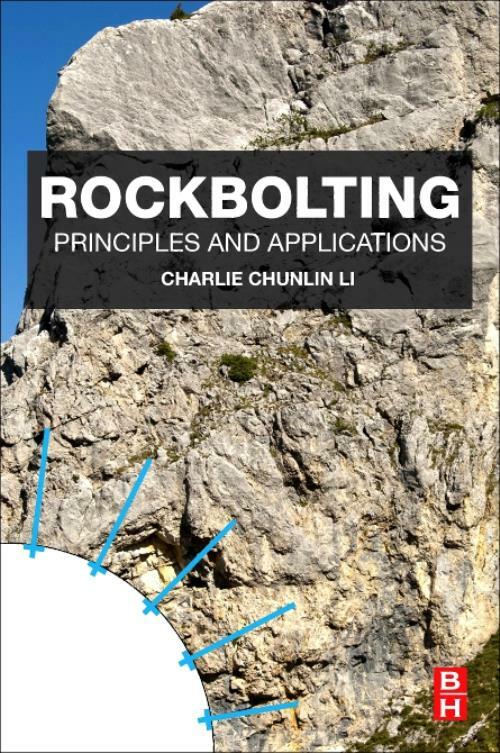 The book introduces the principles and background concepts of rock support, and then offers a comprehensive overview of the mechanics of rockbolting, as well as current rock bolt types such as mechanical, grouted, self-drilling, grouted cables, frictional and yield rockbolts. Installation and performance assessment are covered next including load-displacement curves and energy-absorption capacities. Two chapters on design and quality control, respectively, cover failure mechanics, the selection process and the connections with other supporting devices. On quality control, the author explains the usual tests and displacement measurements. The final chapter brings current case studies that combine the concepts presented in the whole book. The book is a professional reference for engineers in the mining and geotechnical industries and can be used as research material for academics in rock mechanics and stability studies. Dr. Charlie Chunlin Li has a career of over 25 years in rock mechanics for mining and civil engineering. He received his BEng and MEng in geological engineering from the Central South Institute of Mining and Metallurgy in China, his Licentiate and PhD in rock mechanics from the Luleå University of Technology (LTU) in Sweden. He worked as a research associate and then associate professor (Docent) at LTU for 7 years after his PhD study. After that he worked as a mining engineer in a Swedish deep metal mine for 4.5 years. He was appointed as Professor of Rock Mechanics in the Norwegian University of Science and Technology (NTNU) in 2004 and has since been in charge of teaching and research programs in rock mechanics for mining and civil engineering in NTNU. He was part-time Chief Technology Officer for Dynamic Rock Support AS (DRS) from 2008 to 2013. Professor Li is a member of the Norwegian Academy of Technological Sciences (NTVA). He is nominated to the ISRM vice president for Europe of the International Society for Rock Mechanics (ISRM) (Election in May 2015).